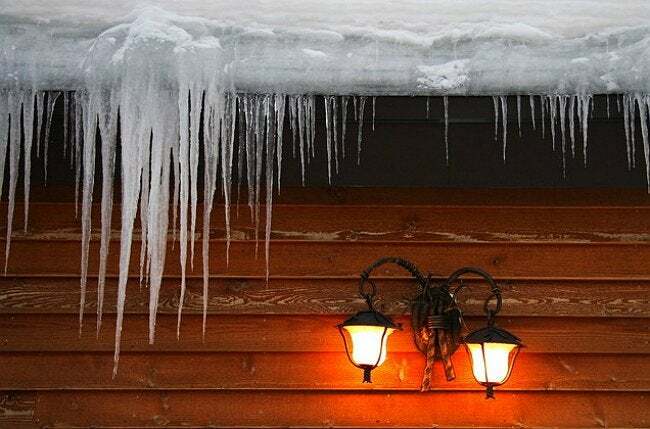 Bob Vila Radio: Fix Ice Dams—Fast! Though it's no substitute for comprehensive, permanent prevention measures, you can use this clever trick to resolve an ice dam problem before it leaves lasting damage. If you live in an area of the country with cold winters, you are likely familiar with ice dams. These are the ridges of frozen water that form along the edges of roofs. Ice dams occur when heated air in your home rises, finding its way into the attic and settling on the underside of the roof. There, the presence of warm air causes any snow on the roof to melt. The snowmelt drains down the roof until it reaches the cold overhang of the roof, where if it refreezes, an ice dams forms. Ice dams can lead to all sorts of damage, mostly stemming to the fact that, once the ice dams are entrenched, they prevent the roof from shedding any additional melted snow or rain. With nowhere else to go, the captive water can leak into the house, rotting wood or inciting the growth of mold. Find a pair of old nylons and fill one of the legs with store-bought or homemade ice melt. Drape the nylons on the roof in such a way that the stuffed leg crosses the ice dam and the gutter. Eventually, the chemicals will melt that section of the ice, creating a gap through which water can slide down off the roof pitch.